Last Thursday, two Molokai fishermen were stranded after their 18-foot boat capsized. A Coast Guard crew was able to quickly locate them and hoist them to safety after the fishermen activated an emergency beacon on board their vessel called an EPIRB, which stands for emergency position-indicating radiobeacon. Anthony Bourdain, a celebrated chef, TV personality, travel and food commentator and host of the award-winning series, “Parts Unknown,” died last week at the age of 61. In 2015, Bourdain visited Molokai as part of the series’ episode on Hawaii food and culture, and many Molokai residents have been reacting to his death and offering tributes of their memories of him. Bourdain himself wrote fondly of Molokai on his blog following his visit. With the continuing volcano and earthquake activity on Hawaii Island, many Molokai residents have their bags packed, ready to run for higher ground in case a tsunami is triggered. But Cindi Preller, duty scientist and geologist at the Pacific Tsunami Warning Center, said that scenario is highly unlikely. Molokai’s landfill is looming larger each year, and the existing facility is slated to reach capacity by mid-2020. Maui County’s Dept. of Environmental Management is now proposing a $6.5 million plan to add two new disposal cells to the Molokai Integrated Solid Waste Management Facility in Na`iwa that would bury the island’s waste disposal needs until 2038. A team of committed students, teachers and community members participated in the statewide Blue Line Project to “draw the line on climate change” and raise community awareness of sea level rise projections for Molokai last Saturday. 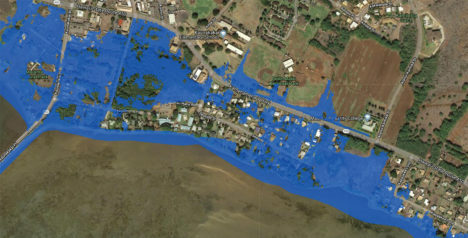 Sust`aina ble Molokai helped volunteers create a temporary blue line of ocean images and climate change messages along Kamehameha V Highway in front of Duke Maliu Regional Park to show the area vulnerable to permanent flooding in the next 40 years. “We chalked in a blue line to show where the new shoreline will be if we don’t take drastic measures [to address] climate change, sea level rise, and carbon emissions,” explained Vicki Newberry, team leader for Aka`ula School. On Saturday, May 5, a group of Red Cross volunteers will be installing free smoke alarms in homes in need on Molokai as part of the Red Cross Home Fire Campaign. Red Cross volunteers will also be sharing fire safety information. Smoke alarm installations are by appointment only. To make an appointment, please call and leave a message at the Maui Red Cross office at 808-244-0051 ext, 159. One of Stephanie Crabbe’s greatest joys is playing a pivotal role in helping people regain their hearing. “It is life-changing when someone can suddenly hear,” says Stephanie, owner of Audibel Hearing Center, which will be offering visits on Molokai this week. Stephanie has witnessed amazing transformations — for example: first-time patients who are sad and withdrawn are suddenly elated from recovering the precious sense of hearing. She enjoys seeing how those individuals quickly become more active members of the community, regain lost relationships and just enjoy life more. This winter has brought “unprecedented” ocean fatalities on Maui, according to the Maui Fire Department. 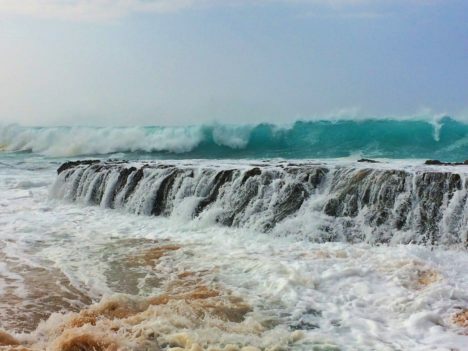 Though there have been no close calls reported on Molokai so far this season, officials are warning those entering the water to use caution, as winter swells bring strong current and high surf. 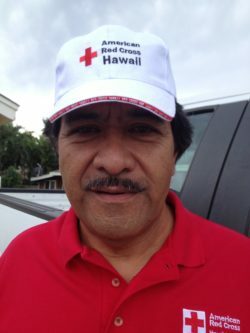 Molokai resident and Red Cross volunteer Lester Keanini is among 16 Hawaii Red Cross members deplayed to the mainland to assist with those devastated by Tropical Storm Harvey. Keanini is currently in Texas assisting with sheltering of the thousands of people who had to leave their homes during flooding. Effective immediately, the Department of Hawaiian Home Lands (DHHL) is lifting the water usage restriction for Molokaʻi residents who receive their potable water from the Hoʻolehua reservoirs. The Hawaii State Department of Health (DOH) completed the microbiological and chemical testing of the Hoʻolehua water system and has determined that it is safe to resume normal water usage and consumption.